What will Pop.Up next? We’re floating away, being carried skyward by PAL-V’s, JetPack’s 12-rotor machine, e-volo’s 16-rotor design, and even Hoversurf’s four-rotor flying donor-cycle. At least a half-dozen other varieties of VTOL (vertical takeoff and landing) commuter machines are coming at us with bewildering speed. 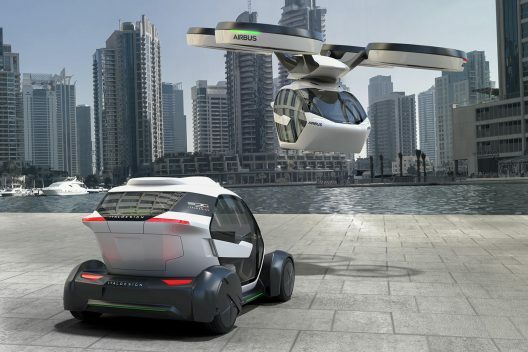 If nothing else, the competing visions of future aerial transport show some kind of deeply felt need to escape the surly bonds of earth, or at least its eternal gridlock. 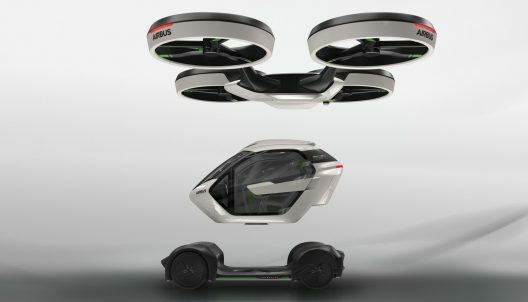 Airbus has already played one hand, showing its cards with Silicon Valley-based A3 (A Cubed) and a vehicle looking like a combination of NASA’s X-57 Maxwell and Joby Aviation’s S2. It pulled another card from its sleeve this week at the Geneva Auto Show, unveiling its Pop.Up concept vehicle, conceived with ItalDesign. 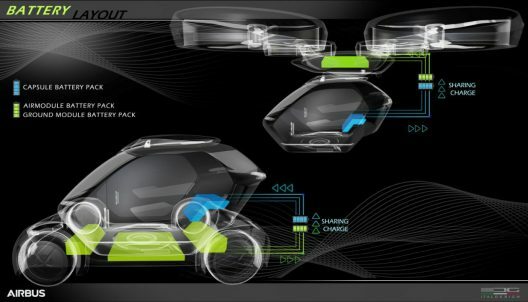 Pop.Up is a carbon-fiber pod that can be attached to self-driving wheels, a railway or Hyperloop link, or lifted by an eight-rotor autonomous drone carrier. An artificial intelligence platform will determine the best mode for your selected journey, although you might choose the manner in which you go. A user interface communicates with you in the pod (“dialogues with users”), while the wrap-around head-rests apparently read your mind. In the video, Sara wakes to be alerted that a meeting is imminent. Not to fear, since she can sip her morning coffee while summoning her Uber-like ride, a Pop.Up in its wheeled configuration. Beginning the journey, it performs a biometric assessment to ensure Sara is the correct rider, and sorts out her mental state, letting her know she is 70-percent joyful. Much nicer than a (sometimes) gruff Uber driver. At some point, Sara is swept away when a large cluster of rotors attaches itself to her pod. 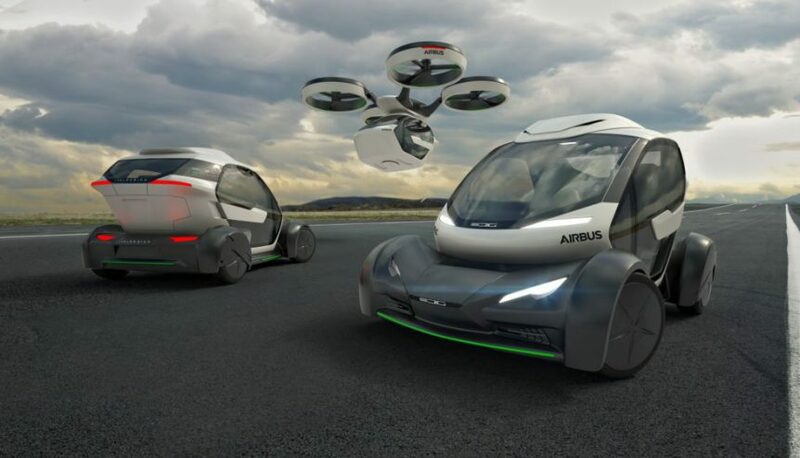 A second version of the video, with interpretation from Airbus and ItalDesign collaborators, gives a more nuanced view of what they hope to achieve. Jorg Astalosch, CEO of ItalDesign is surrounded by the Lamborghinis which his company designs, as well as the manufacturing lines on which they are built. The aerial configuration uses eight 17-kilowatt (22.8 hp.) motors for a total of 136 kilowatts (182 hp.). Its 70 kilowatt-hour battery pack can lift two passengers (600 kilograms gross weight, or 1,320 pounds) and whisk them 100 kilometers (62 miles). Pop.Up, according to the designers, carries more than its own weight (43.9 percent of the gross weight), an impressive number if achieved. Disk loading of 30.4 kilograms per square meter (6.23 pounds per square foot) is greater than even a Bell JetRanger. Noise might be a problem, and it’s hard to determine how the 150 meters per second (492 feet per second) tip speed of the rotors will affect overall noise – especially in their protective ducts. The ground configuration uses to 30 kW (40.2 hp) motors powered by a 15-Kilowatt-hour battery which can be recharged in 15 minutes and would give 130 kilometers (80.6 miles) range. A bit like a kinder, gentler Transformer, Pop.Up could point the way toward a differently mobile future. The nifty animation understates the infrastructure necessary to support these seemingly independent pods. At its heart, such a transportation device will require a significant, sophisticated system to manage its various permutations. Whether such investments will seem wise in the near future remains to be seen.